NEW RELEASE MOVIE REVIEWS – 22 July:.. In what is easily the most enjoyable and pacy of the new Star Trek films, the crew members of the Enterprise are summarily booted out of their plush comfort zone when confronted by a savage enemy that literally shreds their precious ship and sends them all plummeting (via escape pods) to the hostile surface of an alien planet. Coupled with such welcome chaos – stripped of their all-powerful ship and fancy weaponry, they have to rely on cunning and friendship to survive the civilisation- threatening villains – we have Captain Kirk (Chris Pine) caught in a personal crisis. Half-way through his five-year mission of exploration and discovery, he’s wondering whether he is doing any real good, and whether he can measure up to the legend of his father. Also spicing things up is the renewed relationship between traditional sparring partners and uneasy soulmates Dr ‘Bones’ McCoy (Karl Urban) and Mr Spock (Zachary Quinto), whose relationship with Lt. Uhuru (Zoe Saldana) is on the skids. Thematically, the film places the celebration of ethnic diversity that has always been at the centre of the Trek universe as the most important value to defend against the brutal, value-free enemy. Whether or not the film intended to be so topical, it certainly reflects the world situation today. Director Justin Lin, who proved with Fast & Furious 4 his mastery of breathing new life into an aging franchise, takes over from JJ Abrams (Star Wars) with a whipcrack appreciation for balancing action with those crucial character moments that give the soiree meaning. That said, Lin does love his flourishes of fun, which can occasionally cross over into outright silliness. Nonetheless, Lin does earn these moments, making sure they make perfect story sense before unleashing them with unapologetic glee. As dictated by blockbuster movie law, the film brandishes top-shelf visual effects. But what it also possesses that many big films don’t bother with is a beautiful sense of design. In particular is the exquisite, planetoid-sized space port Yorktown that floats lazily in orbit, encased in a large transparent bubble. The few scant moments we spend entering this meticulously designed artificial world makes you wish for an hour-long guided tour of the facility. The sequence is a stand-alone work of movie art. It’s a ravishing vision of an idealised future. It certainly makes you appreciate the huge amount of work that goes into the background of such films, and then to lament how quickly it all has to be digested before moving on to the next story point. The only caveat to seeing this film is to double-check whether you’re seeing it in 2D or in dreaded 3D. This reviewer was lucky enough to preview it in 2D and there’s nothing in it that screams out for that so-called ‘extra’ dimension. The film is dedicated to the late Leonard Nimoy (Spock), who died during the film’s production, and to Anton Yelchin, the talented young American actor who played Russian officer Chekov. It might have been an unintended slip during the final editing of the film, but watch fast near the end, when Kirk toasts to ‘absent friends’. The shot that immediately follows will make your heart skip. 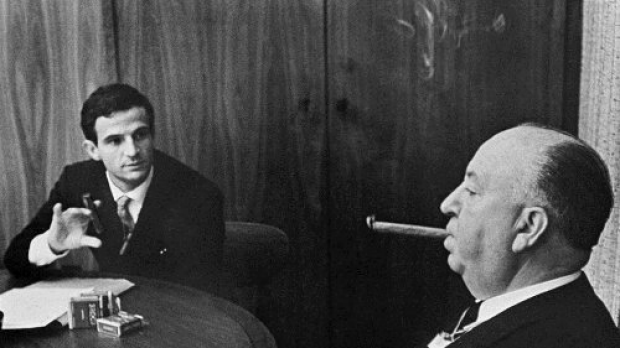 Film talk: Alfred Hitchcock fields questions from Francois Truffaut in the cineaste doco Hitchcock Truffaut. Very good, if overly brief documentary that uses the famous 1962 interviews between French director Francois Truffaut and Alfred Hitchcock to examine the director’s techniques and methods. Admittedly, fans of Hitchcock might find little that is new here, and the umpteenth recitation of the editing in Psycho does make one yearn for a deeper appreciation of his lesser-known silent work and of his less-quoted latter films, such as Marnie, Topaz and Family Plot (arguably and ironically the most under-appreciated of his over-examined filmography). Hitchcock’s legendary wit is on show, as is the enduring influence of his work on subsequent filmmakers. Seeing red: the hapless Teresa Palmer wastes her time, and ours, in the unforgivably dull horror film Lights Out. Teresa Palmer stars in a poorly executed child-in-peril piece of fright-free crud involving a deadly ghoul you can only see when the lights are out. So, why not stock up on high-powered torches? It’s a weak horror premise, poorly done, and the film gets so dreary at one point you feel like yelling out ‘get the kid! Get the kid!’ just so the mess can end. It’s never a good sign when you take the side of the ghoul. And as with the aliens we see in sci-fi films these days, the nether-worldly nasties of the horror genre need a redesign, because look at what we get here. Eyes that light up in the dark. Overly wide mouths. Sharpened teeth. Scrawny features. Ragged clothes. Really? Can somebody think of something new? Please?